Oil and coal have built our civilization, created our wealth, and enriched the lives of billions. Yet their rising costs to our security, economy, health, and environment now outweigh their benefits. Moreover, that long-awaited energy tipping point—where alternatives work better than oil and coal and compete purely on cost—is no longer decades in the future. It is here and now. And it is the fulcrum of economic transformation. A global clean energy race has emerged with astounding speed. The ability to operate without fossil fuels will define winners and losers in business—and among nations. solutions across transportation, buildings, industry, and electricity. 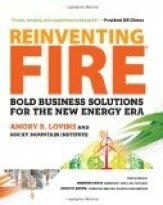 It maps pathways and competitive strategies for a 158%-bigger 2050 U.S. economy that needs no oil, no coal, no nuclear energy, one third less natural gas, and no new inventions. Reinventing Fire charts a pragmatic course that makes sense and makes money. “Alternative Nobel,” Zayed, Blue Planet, Volvo, Onassis, Nissan, Shingo, and Mitchell Prizes, the Benjamin Franklin and Happold Medals, MacArthur and Ashoka Fellowships, eleven honorary doctorates, and the Heinz, Lindbergh, Time Hero for the Planet, National Design, and World Technology Awards. An honorary U.S.
architect, Swedish engineering academician, and former Oxford don, he has taught at nine universities. Among his thirty previous books are Small Is Profitable, Winning the Oil Endgame, and the coauthored business classic Natural Capitalism. Lovins was named one of Time’s 100 most influential people in the world and Foreign Policy’s 100 top global thinkers. He is cofounder, chairman, and chief scientist of Rocky Mountain Institute. eleven honorary doctorates, and the Heinz, Lindbergh, Time Hero for the Planet, National Design, and World Technology Awards. An honorary U.S.